The G.I. Joe Collectors Club has just posted up the first images of FSS 5.0 starting with Charbroil. “We are very excited to offer the fifth limited edition GIJCC Figure Subscription Service. This assortment contains a variety of fan requested characters from all eras of the 3 3/4-inch G.I. Joe: A Real American Hero series. It includes classic 80’s, 90’s, international, and a never before released character to add to your modern era action figure collection. Upon successful completion, you will also receive a BONUS mystery 13th carded action figure with the last shipment. A new Add On set will consist of a 3 Pack of Female Cobra Troopers, sporting a Masked headsculpt. Heartwrencher with Dreadnok Stinger will see a release, but probably not until 2017/2018. 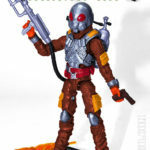 There will be new 12 Inch Super Joe figures with villain that tie in to Adventure Team. JoeCon 2017 will be held in Orlando, FL at Disney World. We’ll bring you more info and images as they become available. You can join in on the continued discussion after the break.